Adjustable Snow Foam Lance with 1/4" quick disconnection fitting. Variable, adjustable Spray Nozzle for accurate mixing and foam generation. Heavy Duty Design, ideal for enthusiast or professional use. Pressure Washer Lance Car Wash Gun Snow Foam Lance Washer Nozzle with 1/4" Quick Connector Foam Cannon Water Jet. Adjustable Snow Foam Lance with 1/4" quick disconnection fitting. Variable, adjustable Spray Nozzle for accurate mixing and foam generation. The gentle cleaning power won't remove wax so you know your car is always protected. The Mr. Pink Car Wash Shampoo is gentle and surface safe so it can clean any area of your vehicle from wheels to paintwork. Type: Car Foam Lance Bottle. Put the fitting/adapter with brass tube and suction tube on foam lance unit. Attach fluid bottle to foam lance unit. Fill fluid bottle with water (for best results, use warm water, 20% shampoo 80% water is suggested). SONAX Wheel Cleaner Full Effect. SONAX Wheel Cleaner full effect is a highly effective, acid-free and pH balanced rim and wheel cleaner that is safe for all wheels, including aluminum and alloys. This formulation is also effective and safe for use on painted wheels and will not deteriorate clear coats.Watch video here. CarPro Reset Intensive Car Shampoo creates mounds of thick suds that rinse cleanly off the vehicle. Benefits of CarPro Reset Developed for use with all CarPro Nanotechnology Sealants and Coatings including Reload, Hydro2, and CQuartz. SONAX Wheel and Rim Cleaner Full Effect 16.9 oz. 2 Bottles Safe on Chrome SAVE! SONAX Wheel Cleaner full effect is a highly effective, acid-free and pH balanced rim and wheel cleaner that is safe for all wheels, including aluminum and alloys. This formulation is also effective and safe for use on painted wheels and will not deteriorate clear coats.Watch video here. Your car is drenched in a rich, gently cleansing lather. You'll get more than enough suds to wash your entire vehicle, from just a spare amount of Gold Class Shampoo & Conditioner.The secret blend of conditioners nourish the surface and acts to lubricate the washing area, preventing the abrading effects caused by friction. Chemical Guys Clean Slate Surface Cleanser Car Wash and Surface Prep is safe for use on paintwork, vinyl, rubber, glass and plastic. Clean Slate works to gently release old layers of wax without causing any etching or staining. Wolfgang Uber Rinseless Wash is a highly concentrated, viscous liquid that creates 3 gallons of rinse-free wash solution with just one ounce of concentrate. Rinse-free wash?. That’s correct! Wolfgang Uber Rinseless Wash with its advanced formula enables you to wash your entire vehicle without rinsing it off. EVERGREEN Shampoo Gun: 127:1, Dilutions: Hand Washing: 127:1. CHERRY SUDS is a thick, super concentrated, high foaming car wash soap. Excellent for hand or automatic washing systems. Dilutes 1 part CS to 128 parts water. Super-Concentrated High pH Formula! Only $10.40/Gallon! Liquid X Foam Wash Gun - Car Washing Made Simple! The soapy water lifts dirt and debris from the surface for safe, gentle washing. This easy to use foam gun attaches to any garden hose. Make washing your car a fun and easy experience with the Liquid X Foam Gun! 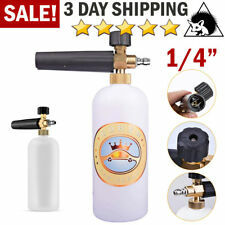 Adjustable Foam Lance, foam cannon with 1/4" quick disconnection fitting, 33 OZ (1 litre) container bottle. Easy to install - Insert directly into your pressure washer; all connectors are made of high quality brass. Size:16 fl. Oz (Single Unit) Maintaining your vehicle’s protective wax or sealant layer is important. Wax and sealant protect your car from UV rays, water spots, and contamination. Mr. Pink works to maintain your protective wax or sealant layer. Maintaining your vehicle’s protective wax or sealant layer is important. Wax and sealant protect your car from UV rays, water spots, and contamination. Mr. Pink works to maintain your protective wax or sealant layer. The Rejuvenator is 100% active super concentrate! Users will quickly find out very little goes a long way. Full size vehicles will only need a few ounces to do all the trim. The HoneyDew Snow Foam Premium Hyper Foaming Car Wash is engineered to create millions of tiny close-grouping cleaning bubbles. The HoneyDew Snow Foam Premium Hyper Foaming Car Wash is developed to be safe on all vehicle surfaces including paint, rubber, vinyl, glass and plastics. CAR WASH BUG REMOVER POLISH. SUPER CONCENTRATED, DOES 20 CARS. APPLY DIRECTLY TO MITT. Clean vehicles quicker this is the product for you.CESCO VINYL MASTER is a low alkaline detergent formulation containing a proprietary blend of wetting and emulsifying agents. Great for large trucks semis buses RVs and and fleet accounts. Pressure Washer Lance Car Wash Gun Snow Foam Lance Washer Nozzle with 1/4" Quick Connector Foam Cannon Water Jet. Adjustable Snow Foam Lance with 1/4" quick disconnection fitting. Capacity:0.22 Gallon(1L). Zymol Natural Concentrate Auto Wash. Auto Wash is the hard working car wash designed to extract heavy dirt, oils and insect tar while protecting your finish. A combination of pure Coconut Bark Soap and natural oils lift dirt so it washes away. Mothers, wheel brush, non-slip comfort grip, lightweight design, extra soft scratch free bristles, protective rubber bumper, also perfect for fender wheels. Soft, gentle bristles reach tight spots. Ideal for cleaning wheels, fenders, and bumpers. 3-Level Max Power Cleaner Concentrate. Car Wash by Turtle Wax. This Car Wash by Turtle Wax is. Car Wash by Turtle Wax. the only wash that increases the. The more you pour into your wash bucket. Wash car from top down. The surfactants used in CarPro HydroFoam will gently lift and remove dirt from your paint, greatly reducing the risk of washing induced swirls. The next evolution of CarPro Hydro2! The sleek coat that is left behind not only enhances your paints’ finish but is also resistant to UV exposure, almost all acids, solvents, and alkaline solutions.Your paint is also now more dirt and water repellent than it ever was before. Chemical Guys CWS402 Mr. Pink Super Suds Car Wash Soap and Shampoo - 1 Gal. Chemical Guys CWS107 Extreme Body Wash and Synthetic Wax Car Shampoo 1 Gal.